The towns of Clearwater Beach and St. Petersburg in the Tampa Metropolitan Area, have miles of sand, great boating opportunities, and a thriving cultural scene—and it's all accessible within a reasonable price range. It's no surprise that millions of tourists visit the region each year. The Clearwater/St. Pete area is a prime destination for families, too, not only because its own attractions are very kid-friendly, but Orlando and its famous theme parks are only a two-hour drive away. There are 26 communities and 35 miles of shoreline on this Clearwater/St. Pete peninsula, located to the southwest of Tampa between the Gulf of Mexico and Tampa Bay. The communities are varied: you'll find everything from beachy chill neighborhoods to super cosmopolitan areas, with cultures ranging from the Scottish in Dunedin to the Greek in Tarpon Springs. There are two major airports in the area: St. Pete-Clearwater International Airport and Tampa International Airport. Most visitors fly into the Tampa airport, even though it's farther away (about a 45-minute drive from Clearwater and St. Pete) because flights are oftentimes cheaper there. You can book taxis from Tampa to Clearwater and St. Pete, but they're a little expensive—you might be better off renting a car, then using it to explore the area. There are a number of hotels in Clearwater Beach and St. Petersburg that are great for traveling families, including the below. Sheraton Sand Key Resort is a beachside resort, located right next to Sand Key Park in Clearwater Beach. Clearwater Beach Marriott Suites on Sand Key is an all-suites property in Clearwater Beach with kiddie pool, playground, Lisa's Klubhouse for kids ages 5 to 12, and activities for teens. Tradewinds Island Grand Resort on St. Pete Beach on Florida's Gulf Coast has many family-friendly features, including suites with kitchen facilities. Families like the inflatable slide on the white-sand beach, and the beach cabanas and water-trikes, five pools, kids club, meandering river with paddle boats. There's more than enough fun activities in Clearwater Beach and St. Petersburg to fill a week-long family vacation—you might have to come back more than once to do them all. Hit the high seas: Get out onto the water, whether that's on a fishing charter, a dolphin-watching trip, or just a pleasure ride. 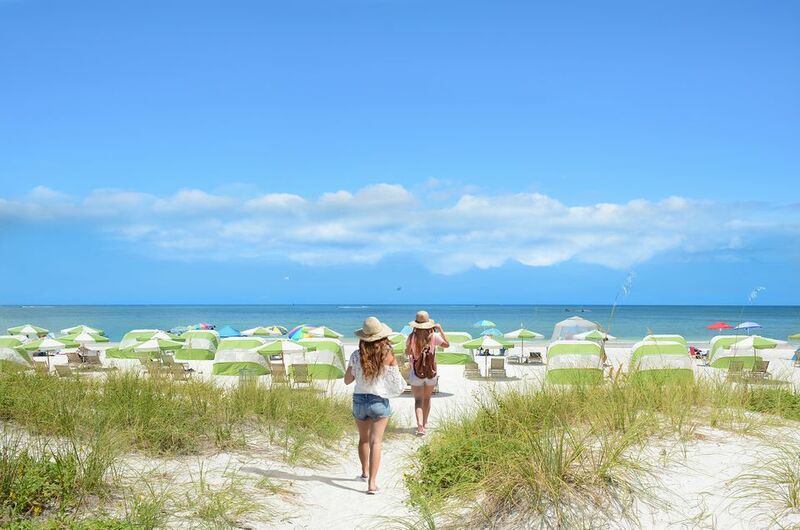 Enjoy a day at the beach: Don't worry if you're not staying in a beachfront hotel—there are plenty of amazing public beaches in town, including Sand Key Park, Fort De Soto Park, and Pass-a-Grille Beach. Visit the Clearwater Marine Aquarium: This aquarium is best known for its dolphin in residence, Winter, who was the inspiration for the film Dolphin Tale. The aquarium focuses on rescuing, rehabilitating, and releasing sick and injured animals. Indulge in an adrenaline rush at Busch Gardens Tampa Bay: Located in Tampa Bay, this theme park has plenty of high-thrill rides from roller coasters to water slides. Sail on a pirate cruise: Captain Memo's Pirate Cruise is a Clearwater Beach staple. The bright red pirate ship sets sail multiple times a day and features costumed performers, a treasure hunt, dancing, face painting, and more. Go birdwatching at Suncoast Seabird Sanctuary: If your kids are budding naturalists, head to this sanctuary, home to hundreds of rescued birds. Stroll the piers: The St. Petersburg Pier juts out a mile from the mainland and his home to The Pier Aquarium, shops, restaurants, and more. On Clearwater Beach, Pier 60 and its surrounding park have a free daily Sunset Festival with artists, street performers, and free evening movie screenings. Explore the Salvador Dalí Museum: One of St. Pete's many museums is the Salvador Dali Museum, which offers great programming for families, from storytelling to kid-friendly tours to arts and crafts workshops. Take a day trip to Disney World or Universal Studios in Orlando: Orlando is just a two-hour drive away, so if you're feeling adventurous, you can pop over to its famous theme parks for the day.